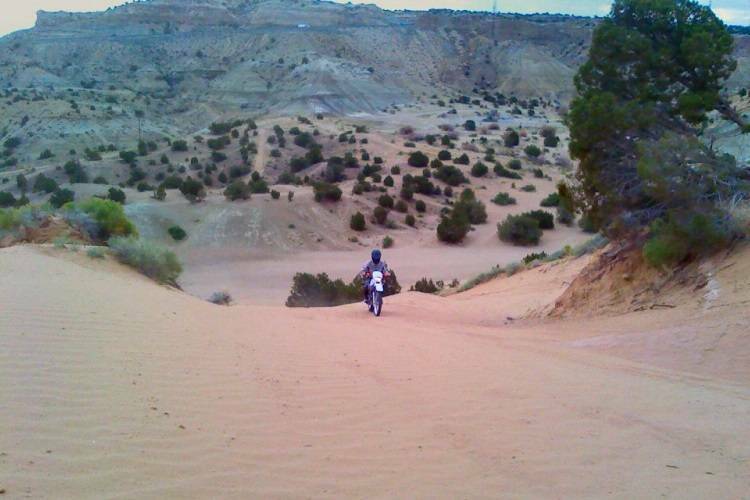 Head Canyon OHV Recreation Area is popular with OHV motorcross and has a variety of rough driving terrain types. The trails and terrain appeal to many skill levels. Geospatial coordinates are Latitude: 36.685822 Longitude: -108.216646. The turn off for Head Canyon is located south of the entrance to Dunes Vehicle Recreation Area. From Farmington, travel south on Highway 371. The turn off is marked with a wooden BLM sign, on the east side of the road, once you top the bluffs. Head Canyon is public land and managed by the Bureau of Land Management. The area does not have comfort facilities, picnic areas, or campsites. Paths within the recreation area are also popular for biking, hiking, and viewing wildlife. Dry camping is available. For additional inforamtion contact the BLM Farmington Field Office at 6251 College Blvd. in Farmington, or by calling (505) 564-7600. If you are interested in exploring Head Canyon, Dunes Recreation Area, Chokecherry Canyon / Glade Run Recreation Area or any of the off roading hot spots in the Farmington area but do not have an OHV, Let Four Corners Explorers help! Four Corners Explorers is a local, family-owned business that offers cutting-edge UTV rentals for you and your friends or family to venture out into nature and have a thrilling experience like never before. Our machines are built to be extremely safe and always fun.